You can find an amazing selection of old-fashioned goodies and treasures at the Hillside General Store, which is sure to remind you of your favorite five and dime store! This shop in the Craftsman’s Valley section of the park is like stepping back in time and has something for just about everyone! After shopping, relax on the porch to play checkers or take a seat to enjoy a few minutes of people watching. You can even send a postcard postmarked “Dollywood” to your friends back home from the post office within the Hillside General Store! No shopping trip to Dollywood is complete without a stop at the Cozy Bear Cove, which is inspired by the dens of black bears in the Great Smoky Mountains! This store features a charming cabin atmosphere where you can find all types of mountain related souvenirs to bring home with you. If you love stuffed animals, check out the display of plush bears to find the perfect one to snuggle with in the evenings! The Cozy Bear Cove also has plenty of soft warm blankets, lovely cabin decor and other cute gifts for the home. As one of the most unique shops in Dollywood, Rivertown Garden & Gifts features themed garden flags, stakes and stepping stones to add a special touch to your garden! This is the perfect opportunity to bring home a gift for your garden space so that you will be reminded of your vacation in the Great Smoky Mountains! If you are visiting during the colder months of the year, stop in Rivertown Garden & Gifts for an awesome collection of seasonal Fall and Christmas items! For the ultimate shopping experience in the park, visit the Dollywood Emporium before leaving for the day! This huge store features the best of the shops in Dollywood all in one place, with a large selection of apparel, hats, gifts and accessories for everyone in the family. Whether you want a Dollywood T-shirt, a fun toy, a tasty jar of specialty jelly or a magnet for your refrigerator, you will find it all at the Dollywood Emporium at the front of the park on Showstreet. Stay close to all of the shopping options at Dollywood with a vacation at Acorn Cabin Rentals! 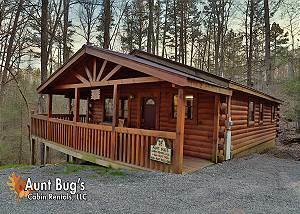 We have cabins of all sizes to accommodate your needs, ranging from 1 bedroom cabins for a romantic getaway to an 8 bedroom cabin for a large family or group of friends. While staying in our beautiful cabins, enjoy a wide range of amenities, including private decks with scenic views, fully equipped kitchens, bubbling hot tubs, fireplaces, game rooms and more. Check out all of our cabins in Pigeon Forge and Gatlinburg today to plan a vacation near these wonderful shops in Dollywood. We hope to see you soon at Acorn Cabin Rentals!